What is the difference between a soft and hard bounce? When you send out your campaign you'll probably notice that some of your emails won't be delivered. Emails that can't be delivered are called bounces. Learn what the difference is between a soft and hard bounce. Soft bounces are emails that exist, but for some reason, they couldn’t be delivered. Generally a soft bounce will be something temporary like a "out of office" message or "full mailbox." Soft bounces are considered temporary until they are proven to be invalid addresses. What should you do about soft bounce? You shouldn't have to worry about these too much. Usually, the next time you send an email it will be resolved. You should keep an eye out for very high soft bounce rates however, as it can signal a spam blocking issue. Soft bounces return as 400 SMTP error codes. The following chart shows the most common soft bounce categories. Hard bounces are always invalid addresses. The address can be invalid for two reasons: (1) the domain doesn't exist (example "address@notrealdomain.com"), (2) the domain does exist, but the local part of the address is invalid (example "not_a_real_address@gmail.com'). In very rare cases, the ISP may send back a hard bounce response for a valid email address. The response is still handled as a hard bounce in WordFly. You may try sending to the hard bounce again if the subscriber states the address is valid. If, however, the address hard bounces again the subscriber should reach out to their ISP to troubleshoot why they are sending out a hard bounce. What should you do about hard bounces? Make sure you aren't sending to invalid addresses. Remove bad addresses from your list immediately. Repeated sending to invalid addresses can land you on blocklists and lead to deliverability issues. Hard bounces return as 500 SMTP error codes. How are soft and hard bounces handled? Hard bounces When this response is received by WordFly the subscriber is flagged as an issue and removed from your future list imports. Learn more about managing hard bounces in your account. Soft bounces When this response is received WordFly attempts to send the email at regular intervals for up to 72 hours. We retry after 20 minutes and then wait incrementally longer after each attempt before expiring the message after 3 days. The initial soft bounce is logged immediately. Other responses (opens etc) may also be logged for the subscriber if a delivery is successful. How can you see the bounces in your campaign? There are two ways you can see soft and hard bounces for your email campaign: Reporting > Sent Email Campaigns or Reporting > Export Data. Option 1: Find bounces under email campaign reporting. Go to Reporting > Sent Email Campaigns, select the name of your sent email, and review the Hard Bounces and Soft Bounces tabs to see bounce results. Click on the magnifying glass to see the subscribers who bounced. Soft bounces will include categories for more details (ex, timeout, spam block, unknown etc). Option 2: Export your bounce data by email campaign or for your entire account. 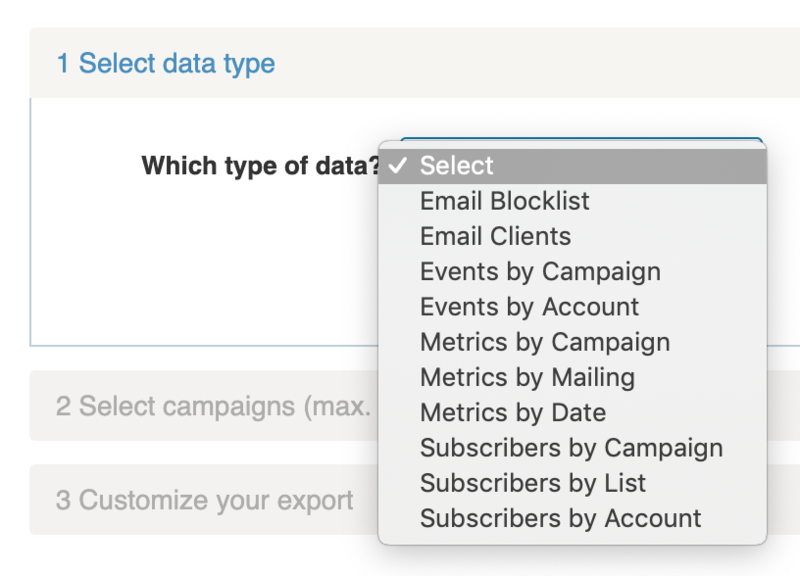 Go to Reporting > Export Data and select Events by Campaign to export bounces by email campaign. Select hard bounce and soft bounce under section 3 (customize your report). Or, go to Reporting > Export Data and select Events by Account to export bounces by account. Select hard bounce and soft bounce under section 3 (customize your report). Learn more about both of these export options.